Our organization provides an advanced range of Tile Adhesive and Grout to our clients, who are fabricated under the guidance of our experts who has a vast knowledge in this stream and these are made using the latest technology techniques and high quality raw material which are sourced from certified vendors of the industry. We offer our range in various capacities, and different sizes. We are specialized in offering Epoxy Based Tile Joint Filler to our clients at affordable prices in the industry. These are processed using premium quality materials and according to the international quality standards. These are available in various specifications and can be customized based on the requirements of the clients. These are widely used for filling tiles without any gaps in various sectors. 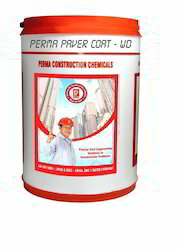 Coating for Paver Tiles Cement Tiles is in the white liquid form and is widely used for coating tiles in various industries. Our range is available in various specifications and can be custom made as per the needs of the clients. We offer these to our clients at competitive prices in the industry. This is widely appreciated by our clients for their efficiency, elegant look to the floor and perfect finish. Owing to the support of our experienced professionals, we offer an unmatched range of Fixing Tiles over Existing Tiles to our clients. This is manufactured using the best quality materials which are highly used in various places like residential complexes, huge buildings. Our offered range gives a perfect solution to improve the interior and exterior furnace of the buildings. With stands temperatures up to 200-degree celcius. Our exclusive array of C-K Tone Filler finds applications in various commercial, residential and industrial applications for jointing the stones or marble stones. We fabricate these products using supreme quality materials based on latest versatile technology, which meets the quality standards. These products are highly demanded in the market owning to their features such as durable, strong, easy to use and harmless. Clients can avail from us these products at most competitive prices. 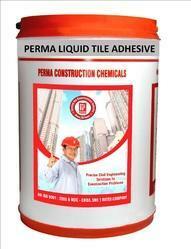 We offer our clients all types of Liquid Tile Adhesive against catalog numbers and client specifications. These are tested on various parameters before supplying them to the clients. Moreover, we also offer customized solutions to our clients for their complete satisfaction. 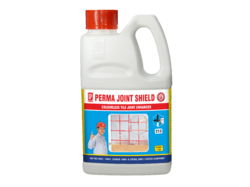 Our range of these products is most extensively used in fixing tiles, marbles and granites. For fixing ceramic tiles on concrete or mosaic floors. For fixing granite slabs on concrete floors. For fixing marble slabs on floors. For fixing skirting on the walls. For fixing glazed, ceramic tiles to walls & floor areas. Liquid Tile Adhesive water proofs the tiled area. Improves adhesion and tensile strength of mortars. 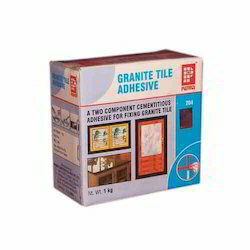 We are well known and prominent manufacturer and exporter of this wide variety of this Tile Adhesive to our clients. Our range of these products is most extensively used in fixing marble tiles and glass mosaic tiles. This is water resistant, easy to install, durable for these large catalogue of features our products are highly demanded across the global markets and are available at good nominal prices. Dry mix 15 kgs of cement (use white cement for fixing marble) with 50 kgs of fine sand. Add two litres of Liquid Tile Adhesive and water to get the desired consistency. Lay the mortar on the floor and spread it evenly. Press the ceramic tiles, granite or marble to position. This mortar is sufficient to fix 37 sq.ft of tiles with a 5mm thick bed. 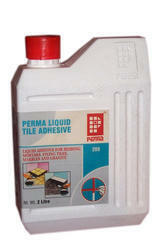 Perma Liquid Tile Adhesive is available in 10 Ltr, 25 Ltr and 100 Ltr Pack. 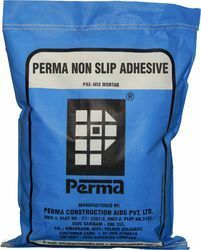 With the esteem support of our clients we provide a wide range of Weather Proof Tile Adhesive which are highly used for fitting glazed, ceramic, terracotta tiles and vitreous tiles to the walls or floors on flat plastered or concrete surfaces. Our products have the applications in fixing tiles or stone cladding on outside walls and tiles in swimming pools and for fixing of marble tiles on any cementations surfaces. We also make sure that our range is free from any defects and ideal for various uses. Hold the tile even at high temperatures. We have been counted among one of the top manufacturers, suppliers and exporters, as we present a wide variety range of Epoxy Based Joint Filler to our esteemed clients. These are used for filling joints between acid proof tiles in the industrial floors. Our products are available in market at most affordable rate. Our range of these products is chemical resistant and water proof. High compressive, flexible and tensile strengths in excess of concrete. Available in range of attractive colors-Brown, Green,Blue,Grey,etc. Easy to use,easy to clean. Epoxy based, supplied in pr-weighted units. Will not support bacterial growth. Catering to the needs of the consumers and based on the current market standards, we are manufacturing and also exporting a high quality range of this Cementations Adhesive which is extensively used for fixing granite tiles and slabs onto horizontal as well as vertical surfaces. Our ranges of these products are highly acclaimed for its best quality as we go through various strict quality checks in order to offer the defect free products to our customers in a wide range and can also be gained from us at cost effective prices. No need of creating mechanical key with expensive epoxies. 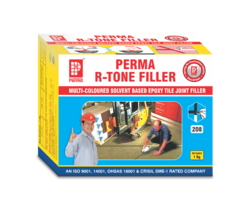 Our expertise also lies in successfully meeting the demands of Tile Joint Filler. Apply the paste in the joints firmly with hand putty blade or sponge, Remove the surplus grout with a wet cloth, after joints are dry, and polish the tiles with clean dry cloth. It is also used for grouting the joints between stones, marble cut stones etc. Available in a range of attractive colors, these adhesives is offered at cost effective prices. The Tile Joint Protector and Enhancer is widely used in various sectors to protect the tile joint filler in the floor tiles from the attack of mild acids. This is produced using premium quality materials and according to the quality standards. Our range is highly demanded in domestic and international markets for their efficiency and long service life. Clients can avail these at nominal prices in the market. We provide a qualitative assortment of Tile Joint Mortar is used for jointing and attaching the materials such as marbles, tiles etc. These products are widely used in residential and commercial applications. These products are highly applauded in the national as well as international market owing to their properties such as reliability, strong, efficiency and durability. Clients can avail from us these products at most competitive prices. 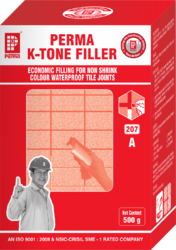 Perma Wide Tile Joint Filler makes the grouted joint waterproof. The product is easy to use. It just needs addition of water to make a good paste which can be conveniently filled into the joints. Makes the grouted area crack free. Ensure that the tile joints are clean and dry. Blow out any dust or dirt from the joints. 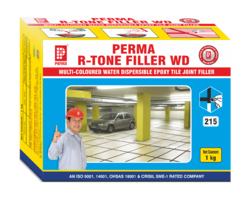 Mix Perma Wide Tile Joint Filler with clean water in the proportion of 3.5 volumes of powder to 1 volume of water. Mix till a uniform consistency smooth paste of uniform colour is obtained. Leave the paste for 10 minutes in the pan for the entrapped air if any to escape and remix the paste. If the colour of the paste does not match with indicated shade of the shade card remix it till the shade close to the shade card shade is obtained. Apply the paste liberally into the joints with a putty blade and even out the paste in the joint. After 3 to 4 hours, wipe out the excess Perma Wide Tile Joint Filler from the tiles with a wet sponge. Grout the tile joints with Perma Wide Tile Joint Filler after 24 hours of tile laying. For better results the use of an admixture like Perma Bond Repair or Acrylic Bond Repair is recommended. Mix Part A two parts by weight to Part B one part by weight with the help of a slow speed drill equipment to a lump free homogeneous consistency. Spread the material with a spatula or squeeze float in to the joints. Application: Apply masking tape where porosity in tiles or stones is encountered. If not, clean the joints with a blower and apply the grout gel using a squeezy blade. Clean the grouted area with a squeezy sponge dipped in water and finish the surface. Allow the grout to dry through air curing. Perma R-Poxy is available in 1 kg and 5 kg pack size. 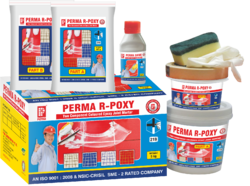 Perma R-Poxy has a shelf life of 12 months from the date of manufacture. Joint Filling is used in various construction and engineering industries for different kinds of applications. We offer customization of these products according to the specifications of the clients. These are made using superior quality materials that are tested on various parameters to ensure their utility and efficiency. Clients can avail these at reasonable prices in the market. Looking for Tile Adhesives and Tile Grout ?